Marseille (/mɑːrˈseɪ/; French: [maʁsɛj] (listen), locally [mɑχˈsɛjə]; also spelled in English as Marseilles; Provençal: Marselha [maʀˈsejɔ, -ˈsijɔ]) is the second-largest city of France. The main city of the historical province of Provence, it is the prefecture of the department of Bouches-du-Rhône and region of Provence-Alpes-Côte d'Azur. It is located on French Riviera coast near the mouth of the Rhône. The city covers an area of 241 km2 (93 sq mi) and had a population of 852,516 in 2012. Its metropolitan area, which extends over 3,173 km2 (1,225 sq mi) is the third-largest in France after Paris and Lyon, with a population of 1,831,500 as of 2010. Marseille is a major French centre for trade and industry, with excellent transportation infrastructure (roads, sea port and airport). Marseille Provence Airport is the fourth largest in France. In May 2005, the French financial magazine L'Expansion named Marseille the most dynamic of France's large cities, citing figures showing that 7,200 companies had been created in the city since 2000. 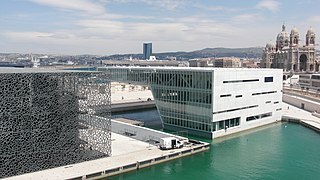 Marseille is also France's second largest research centre with 3,000 research scientists within Aix Marseille University. As of 2014, the Marseille metropolitan area had a GDP amounting to $60.3 billion, or $36,127 per capita (purchasing power parity). ^ "Marseille Espérance. All different, all Marseilles, Part II". 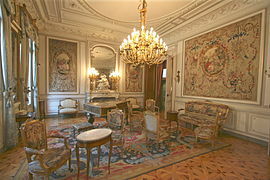 France Diplomatie. Retrieved 10 April 2010. The 2017–18 UEFA Europa League was the 47th season of Europe's secondary club football tournament organised by UEFA, and the 9th season since it was renamed from the UEFA Cup to the UEFA Europa League. The final was played at the Parc Olympique Lyonnais in Décines-Charpieu, France. Atlético Madrid defeated Marseille to win their third Europa League title. As winners, Atlético Madrid earned the right to play against the winners of the 2017–18 UEFA Champions League, Real Madrid, in the 2018 UEFA Super Cup. Moreover, they would also have been automatically qualified for the 2018–19 UEFA Champions League group stage, but since they had already qualified through their league performance, the berth reserved was given to the third-placed team of the 2017–18 Ligue 1, the fifth-ranked association according to next season's access list.Manchester United qualified for the 2017–18 UEFA Champions League as the title holders of Europa League. They were unable to defend their title as they qualified for the Champions League knockout phase. Adil Rami (French pronunciation: ​[adil ʁami]; Arabic: عادل رامي‎; born 27 December 1985) is a French professional footballer who plays as a central defender for French club Marseille. Rami began his football career playing for amateur club Étoile Fréjus Saint-Raphaël, then known as ES Fréjus. Due to only playing the sport as a hobby, he spent three seasons at the club playing in the Championnat de France amateur, the fourth division of French football. In 2006, Rami ascended three divisions after signing with Ligue 1 club Lille. At Lille, Rami developed into a starter, making his professional debut in May 2007. He is nicknamed "Shrek" by teammates and Lille supporters. In January 2011, Rami joined Spanish club Valencia on a four-year contract. However, he was immediately loaned back to his previous club and was a part of the Lille team which won the league and cup double. Despite constant early inquiries from Morocco prior to his first selection, Rami chose to play for his home country of France. He was pre-selected to play for France at the 2010 FIFA World Cup but did not make the final squad. Rami made his senior debut on 11 August 2010 in a friendly match against Norway. France won the 2018 FIFA World Cup, of which Rami was a member. Aix-Marseille University (AMU; French: Aix-Marseille Université; formally incorporated as Université d'Aix-Marseille) is a public research university located in the region of Provence, southern France. It was founded in 1409 when Louis II of Anjou, Count of Provence, petitioned the Pisan Antipope Alexander V to establish the University of Provence. The university as it is today was formed by the merger of the University of Provence, the University of the Mediterranean and Paul Cézanne University. The merger became effective on 1 January 2012, resulting in the creation of the largest university in the French-speaking world, with about 74,000 students. AMU has the largest budget of any academic institution in the Francophone world, standing at €750 million.The university is organized around five main campuses situated in Aix-en-Provence and Marseille. Apart from its major campuses, AMU owns and operates facilities in Arles, Aubagne, Avignon, Digne-les-Bains, Gap, La Ciotat, Lambesc and Salon-de-Provence. 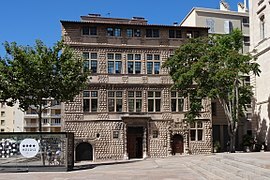 The university is headquartered at the Pharo, Marseille.AMU has produced many notable alumni in the fields of law, politics, business, science, academia, and arts. To date, there have been four Nobel Prize laureates amongst its alumni and faculty, as well as a two-time recipient of the Pulitzer Prize, four César Award winners, multiple heads of state or government, parliamentary speakers, government ministers, ambassadors and members of the constituent academies of the Institut de France. Didier Claude Deschamps (French pronunciation: ​[didje deʃɑ̃]; born 15 October 1968) is a French retired footballer who has been manager of the France national team since 2012. He played as a defensive midfielder for several clubs, in France, Italy, England and Spain, such as Marseille, Juventus, Chelsea and Valencia, as well as Nantes and Bordeaux. Nicknamed "the water-carrier" by former France teammate Eric Cantona, Deschamps was an intelligent and hard-working defensive midfielder who excelled at winning back possession and subsequently starting attacking plays, and also stood out for his leadership throughout his career. As a French international, he was capped on 103 occasions and took part at three UEFA European Football Championships and one FIFA World Cup, captaining his nation to victories in the 1998 World Cup and Euro 2000. In addition to winning two Ligue 1 titles in 1991 and 1992, Deschamps was part of the Marseille squad that became the first, and so far only, French club to win the UEFA Champions League, a feat which the team achieved in 1993; with the Champions League victory, Deschamps became the youngest captain ever to lead his team to win the title. With Juventus he played three Champions League finals in a row between 1996 and 1998, winning the title in 1996. With the Turin side, he also won the UEFA Super Cup and the Intercontinental Cup, as well as three Serie A titles, among other trophies. With Chelsea, he won the 1999–2000 FA Cup, and also reached another Champions League final with Valencia in 2001, before retiring later that season. After Franz Beckenbauer and followed by Iker Casillas, he was only the second captain in the history of football to have lifted the Champions League trophy, the World Cup trophy, and the European Championship trophy.As a manager, Deschamps began his career with Monaco, and helped the club to win the Coupe de la Ligue in 2003, and reached the 2004 UEFA Champions League Final, being named Ligue 1 Manager of the Year in 2004. During the 2006–07 season, he helped his former club Juventus win the Serie B title and return to Serie A following their relegation due to their involvement in the 2006 Calciopoli Scandal the previous season. He subsequently managed another one of his former clubs, Marseille, where he won the Ligue 1 title during the 2009–10 season, as well as three consecutive Coupe de la Ligue titles between 2010 and 2012, and consecutive Trophée des Champions titles in 2010 and 2011. On 8 July 2012, Deschamps was named as the new manager of the French national team, leading the team to the quarter-finals of the 2014 FIFA World Cup, the final of UEFA Euro 2016, and he won the final of 2018 FIFA World Cup beating Croatia 4–2. After France's victory at the 2018 FIFA World Cup, Deschamps became the third man to win the World Cup as both a player and a manager; alongside Mário Zagallo and Franz Beckenbauer, following Beckenbauer as only the second to do so as captain. Dimitri Payet (French pronunciation: ​[dimitʁi pajɛt]; born 29 March 1987) is a French professional footballer who plays for Ligue 1 club Olympique de Marseille and the France national team. A set-piece specialist, known for his accurate, bending free kicks, he primarily plays as an attacking midfielder, and is described as a player who is "blessed with terrific technique and dribbling skills".Payet was born on the French island of Réunion in the Indian Ocean, where he began his career playing for local clubs Saint-Philippe and Saint-Pierroise. In 1999, he moved to metropolitan France, joining Le Havre. Payet spent four years at the club before returning home to spend two years playing for AS Excelsior in the Réunion Premier League. In 2005, he joined FC Nantes and, after a successful 2006–07 season, joined AS Saint-Étienne on a four-year contract. With Saint-Étienne, Payet played in European competition for the first time after featuring in the 2008–09 edition of the UEFA Europa League. In the 2010–11 season, he won the UNFP Player of the Month award for September after scoring three goals and helping Saint-Étienne reach first place in the league table. Following the season, in June 2011, Payet joined the defending champions Lille signing a four-year contract. He had two years there and a further two at Olympique de Marseille before moving abroad to join West Ham United. In 2017 he moved back to France to join his old team, Marseille. Hans-Joachim Walter Rudolf Siegfried Marseille (13 December 1919 – 30 September 1942) was a German fighter pilot during World War II. A flying ace, he is noted for his aerial battles during the North African Campaign. All but seven of his 158 claimed victories were against the British Desert Air Force over North Africa. No other pilot claimed as many Western Allied aircraft as Marseille.Marseille joined the Luftwaffe, in 1938. At the age of 20 he participated in the Battle of Britain, without notable success. As a result of poor discipline, he was transferred to another unit Jagdgeschwader 27 (Fighter Wing 27)—JG 27, which relocated to North Africa in April 1941. Ligue 1 , also called Ligue 1 Conforama for sponsorship reasons with Conforama, is a French professional league for men's association football clubs. At the top of the French football league system, it is the country's primary football competition. Administrated by the Ligue de Football Professionnel, Ligue 1 is contested by 20 clubs and operates on a system of promotion and relegation with Ligue 2. Seasons run from August to May. Clubs play two matches against each of the other teams in the league – once home and once away – totalling to 38 matches over the course of the season. Most games are played on Saturdays and Sundays, with a few games played during weekday evenings. Play is regularly suspended the last weekend before Christmas for two weeks before returning in the second week of January. Ligue 1 is one of the top national leagues, currently ranked fifth in Europe behind Spain's La Liga, England's Premier League, Italy's Serie A and Germany's Bundesliga.Ligue 1 was inaugurated on 11 September 1932 under the name National before switching to Division 1 after a year of existence. The name lasted until 2002 before switching to its current name. AS Saint-Étienne is the most successful club with ten league titles in France while Olympique Lyonnais is the club that has won the most consecutive titles (seven between 2002 and 2008). With the presence of 69 seasons in Ligue 1, Olympique de Marseille hold the record for most seasons among the elite, while Paris Saint-Germain hold the league record for longevity with 45 consecutive seasons (from 1974 until at least 2019). The current champions are Paris Saint-Germain, who won their eighth title in the 2018–19 season. The league has been won on multiple occasions by foreign-based club AS Monaco, which makes the league a cross-border competition. The French football champions are the winners of the highest league of football in France, Ligue 1. Since the National Council of the French Football Federation voted in support of professionalism in French football in 1930, the professional football championship of France has been contested through Ligue 1, formerly known as Division 1 from 1933–2002.Prior to this, the first division championship of French football was contested through a league ran by the Union des Sociétés Françaises de Sports Athlétiques (USFSA), an organization that supported amateur sport. The USFSA's league ran from 1894 to 1919 and awarded 22 league titles before being suspended in 1915 due to World War I and the creation and success of the Coupe de France, which had quickly become the country's national competition. The USFSA returned in 1919 changing the league into numerous regional amateur leagues that awarded no league title. This system lasted from 1919 to 1926. In 1926, the first division's reigns were handed over to the French Football Federation. The federation organized and ran a league composed of the regional amateur league champions called the Championnat de France amateur from 1927 to 1929 and awarded three titles before the league was converted to the professional league that exists today in 1932.The first champions of French football were Standard Athletic Club, who defeated The White Rovers 2–0 in Courbevoie on 6 May 1894. The initial championship match was held on 29 April but finished 2–2, so the match was replayed. Standard went on to win the French championship four more times over the next seven years before RC Roubaix took control of the league becoming the first French club to win three straight titles beginning in 1902. Following Roubaix's success, the ownership of the amateur league title began rotating back and forth from the north of France to the south of France with Marseille eventually winning the last amateur title in 1929.The first French football champions of the professional era were Olympique Lillois, a predecessor of Lille, who defeated Cannes 4–3 on 14 May 1933 at the Stade Olympique Yves-du-Manoir in Colombes. Sète were crowned champions the following season and, in 1939, became the first professional club in France to win two titles. Following the conclusion of World War II, Saint-Étienne became the model club of the country winning four consecutive titles from 1966 to 1970. The club won all its 10 titles in a span of 25 years. Marseille repeated Saint-Étienne's feat of four consecutive titles from 1988 to 1992. It would take the club another 17 years to win another title. During the hiatus between Marseille's title in 1992 and the club's most recent in 2010, Lyon established themselves as a top club winning their first title in 2002. The title started a national record-breaking streak of seven successive league championships with the streak coming to an end following the 2008–09 season when Bordeaux eclipsed them winning their sixth title.Saint-Étienne and Marseille have the most titles in French football having won ten each. The majority of Saint-Étienne's titles came during the 1960s and 1970s when the club was led by managers Jean Snella, Albert Batteux, and Robert Herbin. Marseille has nine professional league titles and one amateur title which they won in the 1928–29 season. The club initially equalled Saint-Étienne's number of titles won during the 1992–93 season, but the title was stripped after it was discovered by the Ligue de Football Professionnel (LFP) that the club's president Bernard Tapie had bribed the opposition's players. Tapie was later found guilty of bribery and sentenced to two years in prison. In the 2009–10 season, Marseille equalled Saint-Étienne's number of titles, amateur or professional. As of 2018, Nantes and Monaco are third with eight titles, followed by Lyon and Paris Saint-Germain with seven. Marseille-en-Beauvaisis is a commune in the Oise department in northern France. Founded in 1899, the club play in Ligue 1 and have spent most of their history in the top tier of French football. The club has won ten official league titles (nine times in Ligue 1), ten Coupes de France and three Coupes de la Ligue. In 1993, coach Raymond Goethals led the team to become the first and only French club to win the UEFA Champions League, defeating AC Milan 1–0 in the final. In 2010, Marseille won its first Ligue 1 title in 18 years under the managing of former club captain Didier Deschamps.Marseille's home ground is the 67,000-capacity Stade Vélodrome in the southern part of the city, where they have played since 1937. The club has a large fan-base, having regularly averaged the highest attendance in French football. Marseille's average home gate for the 2008–09 season was 52,276, the highest in Ligue 1. The stadium underwent renovation in 2011, going from its previous capacity of 60,031 to 42,000. Following completion in August 2014, the final capacity increased to 67,000 ahead of France's hosting of UEFA Euro 2016. In 2015, the club was ranked 23rd globally in terms of annual revenue, generating €130.5 million.In 1997, Marseille was purchased by Franco-Swiss businessman Robert Louis-Dreyfus. Following his death in 2009, his widow Margarita became the club's majority shareholder in 2010. In 2016, American businessman Frank McCourt bought the club from her, and appointed businessman Jacques-Henri Eyraud as the club president, with Rudi Garcia appointed as the coach of the club's first team. Provence (, US: ; French: [pʁɔvɑ̃s]; Provençal: Provença in classical norm or Prouvènço in Mistralian norm, pronounced [pʀuˈvɛnsɔ]) is a geographical region and historical province of southeastern France, which extends from the left bank of the lower Rhône River to the west to the Italian border to the east, and is bordered by the Mediterranean Sea to the south. It largely corresponds with the modern administrative région of Provence-Alpes-Côte d'Azur, and includes the départements of Var, Bouches-du-Rhône, Alpes-de-Haute-Provence and parts of Alpes-Maritimes and Vaucluse. The largest city of the region is Marseille. Samir Nasri (born 26 June 1987) is a French professional footballer who plays for Premier League club West Ham United. He primarily plays as an attacking midfielder and a winger, although he has also been deployed in central midfield. He was suspended from football for eighteen months until January 2019 following a doping violation. Nasri is known for his dribbling, ball control and passing ability. He is described as a player whose "vision and imagination make him an unpredictable opponent". His playing style, ability and cultural background have drawn comparisons to French legend Zinedine Zidane.Nasri began his football career playing for local youth clubs in his hometown Marseille. At age nine, he joined professional club Olympique de Marseille and spent the next seven years developing in the club's youth academy at La Commanderie, the club's training centre. In the 2004–05 season, he made his professional debut in September 2004 at age 17 against Sochaux. In the following season, he became a regular starter in the team and also participated in European competition for the first time after playing in the 2005–06 edition of the UEFA Cup. In the 2006–07 campaign, Nasri won the National Union of Professional Footballers (UNFP) Young Player of the Year award and was also named to the Team of the Year. He finished his career with Marseille amassing over 160 appearances. He played in the teams that reached back-to-back Coupe de France finals in 2006 and 2007. In June 2008, Nasri joined Premier League club Arsenal on a four-year contract. He reached prominence with the team in his third season winning the Professional Footballers' Association (PFA) Fans' Player of the Month award on three occasions and being named to the association's Team of the Year. In December 2010, he was named the French Player of the Year for his performances during the calendar year. In August 2011, after three seasons with Arsenal, Nasri joined Manchester City on a four-year contract. In his first season with the club, he won his first major honour as a player as the club won the 2011–12 Premier League. Nasri is a former France youth international and has represented his nation at every level for which he was eligible. Prior to playing for the senior team, he played on the under-17 team that won the 2004 UEFA European Under-17 Championship. Nasri made his senior international debut in March 2007 in a friendly match against Austria. Two months later, he scored his first senior international goal in a 1–0 UEFA Euro 2008 qualifying win over Georgia. Nasri has represented France at two major international tournaments: UEFA Euro 2008 and Euro 2012.